John Eldredge. 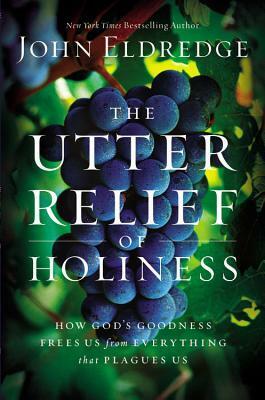 The Utter Relief of Holiness: How God’s Goodness Frees Us from Everything that Plagues Us. New York: Faith Works 2013. 208 pp. $19.99. Reviewer’s Note: At the outset, let me say that this is the first John Eldredge book I have read. I am not unfamiliar with the claims that Eldredge is a bad Bible teacher at best and a heretic at worst. The point of this review isn’t to put those kinds of labels on him, but to simply examine his take on holiness as presented in his recent book. At the same time, I have read excerpts of other works from Eldredge and, as a discerning reviewer should do, I advise you to exercise extreme caution with Eldredge’s teachings. I hope my review will reveal why I feel this way. In The Utter Relief of Holiness, John Eldredge attempts to convince Christians of the necessity of holiness and aid them in the practice of holiness. His goal is to “recover a vision of what holiness actually is,” trusting that a true vision would “absolutely captivate” Christians and be “an utter relief” (18-19). Why an utter relief? Because when we are holy, we will live the way we were made to live. The book’s greatest strength is the focus on motive and heart idols. Holiness is not about faking it; legalism isn’t the road to holiness (50). “Holiness…is a matter of the heart” (52). Repentance is a key to holiness, and Eldredge says we must not focus on external repentance, but on what our heart desires (63). For example, at the end of a long day, the box of donuts calls your name. You long for comfort, and that is a good desire. Donuts aren’t the problem; the direction of your heart is. Holiness is recognizing your need to repent that you long for a false comfort rather than Christ, the only one who can really comfort you (121). In the end, to be holy we must honestly ask if we are looking to something for comfort, assurance, validation, pleasure, etc. over and above what God is for us (173). Eldredge also rightly tells us that before conversion, the Christian had no choice but to sin. Because of the cross, however, we now can fight in the battle against sin. “Without the cross, sin would simply rule in us and over us unchallenged” (104). Christ purchased holiness for us: “Because of the work of Christ for us and in us, we now have the possibility of living a life filled with the captivating goodness of Jesus” (104). The cross must be the springboard for personal holiness, and Eldredge leaps off of this foundation well. Finally, I commend Eldredge because he makes it clear that we can actually advance in holiness. Meditating on what Christ has accomplished in the gospel should lead to Spirit-empowered work and transformation. In other words, we need to put forth some effort in pursuing holiness and we should see progress. We need to work out our salvation with fear and trembling, and we can do so because it is God who works in us (112). The shortcomings, however, severely outweigh these positives. In order to keep this review of manageable length, I’ll mention three of them. First, Eldredge ignores imputed righteousness as the foundation for holiness in favor of imparted righteousness. In chapter 8, “What God Did for You in Jesus,” Eldredge rightly states that “in order to begin experience [holiness]…we need a basic understanding of what has been accomplished on our behalf” (99). After listing five truths of what Christ purchased for us in his death and resurrection, he then writes that the greatest news in heaven or on earth is that “the life of Jesus Christ has been imparted into your being” (103). Earlier in the book, Eldredge said, “The hope of Christianity is that we get to live life like Jesus…The way he does this is to give us his goodness; impart it to us” (42-43). Again, “His beautiful goodness can be ours…He does this by giving us his goodness; he imparts it to us” (179). Imparted righteousness (a Wesleyan doctrine) states that when God regenerates people, there is a righteous principle given to them to strive for holiness. Peter does state that Christians have partaken of the divine nature (2 Pet. 1:4). Christ is in believers by the Spirit who empowers Christians to progressively grow in holiness. Yet Eldredge unhelpfully ignores the biblical and true foundation for holiness: the imputed righteousness of Christ. If a believer’s hope is in the fact that he gets to live the life of Jesus, he will be severely frustrated and disappointed. Biblically, however, the Christian’s hope is on the grace of God supremely revealed in the gospel, namely that God no longer counts his sins against him but has “made [Jesus] to be sin” so that sinners might “become the righteousness of God” (2 Cor. 5:21). This is not a righteousness we must to “live” each day. It is a righteousness revealed by faith—which is our only true hope (Rom. 1:17). Imputed righteousness is not a righteousness that fluctuates in daily practice. It is one that is given as a gift and received by faith and cannot be taken away. It is a perfect righteousness and one that hides the believer with Christ before the Father (Col. 3:3). This must be the foundation and fuel for holiness. Second, Eldredge ignores the cosmic scope of holiness. He rightly emphasizes that God is restoring all of creation (17), but incredibly he neglects the fact that at the center of God’s cosmic restoration program is the church: God’s community of people called to live together and love each other. Holiness is a community project: the local church must be essential if holiness is to be a reality in an individual’s life. Eldredge ignores the church’s role and plugs his Wild at Heart retreats multiple times (53, 133, 158, 167). He fails to mention any corporate means of grace (public worship, preaching, the Lord’s Supper, small group fellowship/accountability, etc), and actually equates “the Church” with the religious leaders of Jesus’ day (154). Third, the picture Eldredge paints of holiness is almost entirely drawn from Jesus’ life as presented in the Gospels. Of course, this is a fine place to examine holiness par excellence! Yet Eldredge fails to expound on the majestic and glorious pictures of God’s holiness in the Old Testament. At best, Eldredge limits the revelation of God’s holiness, implying that the picture of God in the Old Testament is not as compelling as Jesus in the New Testament. Indeed, this could insinuate that the Old Testament is irrelevant or even unnecessary as we seek to understand God’s holiness. Eldredge does many good things in this book. He paints a compelling picture of holiness. He emphasizes the importance of motive, walking the tight line of legalism and license. He is also clear that holiness means making God our treasure (see 171). When I analyze a book, though, I try to ask, “Would I hand this book to another person who’s dealing with this issue?” Unfortunately, Eldredge is unclear, unhelpful, or incomplete in too many areas for me to give this book to another Christian, particularly one who is a recent convert.